Supporting the i.MX7-Dual, the VAR-SOM-MX7 allows designers to use a single System on Module in a broad range of applications to achieve short time-to-market for their current innovations, while still accommodating potential R&D directions and marketing opportunities. This versatile solution’s -20 to 85 °C temperature range and Dual CAN support is ideal for industrial applications. This critical software update allows future-proofing your software build and automatically support new DDR3 component generations which are released every 6-12 months by the vendors. The same SPL and U-Boot will automatically adapt to the new DDR3 internal timing characteristics by retrieving the required parameters stored on the on-SOM EEPROM. 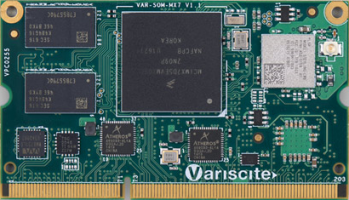 Variscite uses SPL to initialize the RAM using values it reads at runtime from the EEPROM. During production we write the appropriate init values for the RAM chip of each specific SOM on its EEPROM. This way, in the future, when a specific RAM chip gets to its end of life (for example), we can replace it with another (and write its values on the EEPROM), without having to use a different U-Boot image. So after this change customers can use the same SPL and U-Boot images on all of their boards, for the entire life time of their products, and the specific RAM chip on each SOM becomes irrelevant to them. This update was already pushed to all of the Yocto and Debian branches for the VAR-SOM-MX7, and the relevant Wiki pages were updated. It is highly recommended to update to the latest commit of the branch you are using. Also, starting from May 1, 2018, Variscite will replace the default production U-Boot image that is preloaded on the SOMs, and will ship new SOMs with SPL and U-Boot preloaded on them. This page has been accessed 37,599 times.